Agriculture and Livestock Development Minister P. Harrison, SLVA President Dr. Keerthi Gunasekara, and other SLVA officials, at the media conference in connection with ‘VETEXPO 2019’. 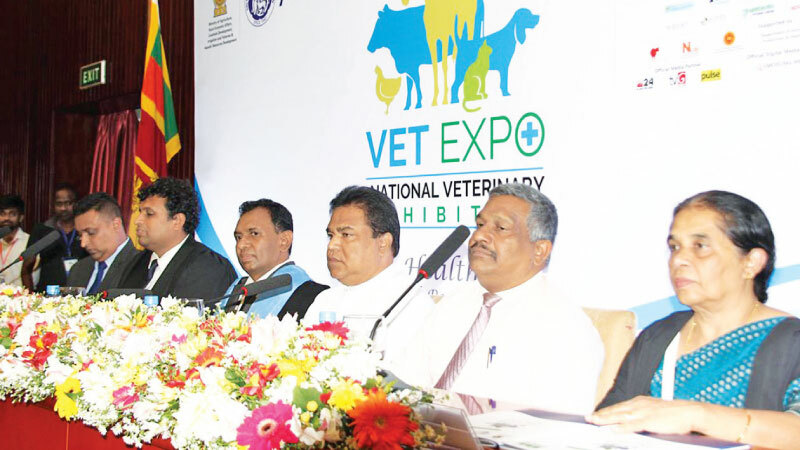 The Sri Lanka Veterinary Association (SLVA) recently marked a milestone in its calendar as the organiser of the first national veterinary exhibition and trade show, ‘VETEXPO 2019’. The event was held from April 5 to 7 at the BMICH and was attended by invitees from the government, provincial councils and local government. During the three-day event, all segments of the veterinary profession, including pet, livestock, wildlife, public health and other related industries came together to showcase the opportunities in the veterinary sector for a healthy animal, healthy human and healthy planet. The exhibition was a platform to celebrate animals and veterinarians, and to recognise their contribution to society. It was a unique opportunity for animal lovers to explore the services and solutions provided by the veterinary profession to animal healthcare, welfare and management and to understand the value of the profession for the betterment of the community. The exhibition also served as a platform to connect with more than 5,000 visitors comprising students, undergraduates, farmers, veterinarians, other professionals, entrepreneurs, and the public. Further, it created the opportunity to reconnect with existing customers and to form new relationships with potential clients within one location. VETEXPO 2019 comprised six main sections: pet, dairy, poultry, aquaculture, wildlife and public health. Further, the Public Health forum hosted leading speakers from around the world to discuss current issues of concerns related to the health of the community.